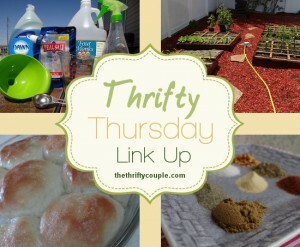 Welcome back to the Thrifty Thursday link party! This party continues to grow each week and we love seeing all the new things you link up. Be sure to spread the word about the party because more links = more exposure for everyone. Not a blogger? Don’t worry…you still want to check out this post! It is full of great money saving tips, thrifty ideas, recipes and crafts from around the internet! Thank you so much for featuring my Wardrobe on a Budget post! I hope y’all have a great weekend! Thanks for the linky! Have a great weekend. Thanks for sharing our slow cooker recipe round-up! Some great posts this week! Thank you for the link up! Thanks so much for hosting the link-up! I’m so happy to have found your site. I was on vacation this weekend and I came back to find out such a nice treat. Thanks so much for including my post in your features! I really appreciate the honor!! !